Good Smile Company releases its first wave of Attack On Titan Nendoroids with the Colossus Titan Playset. This is not your typical Nendoroid release because of its huge amount of accessories it come with and fully embraces the idea of a Lego like playset. This playset lets you recreate the opening scene from Attack on Titan as the Colossus Titan breaks the Wall. 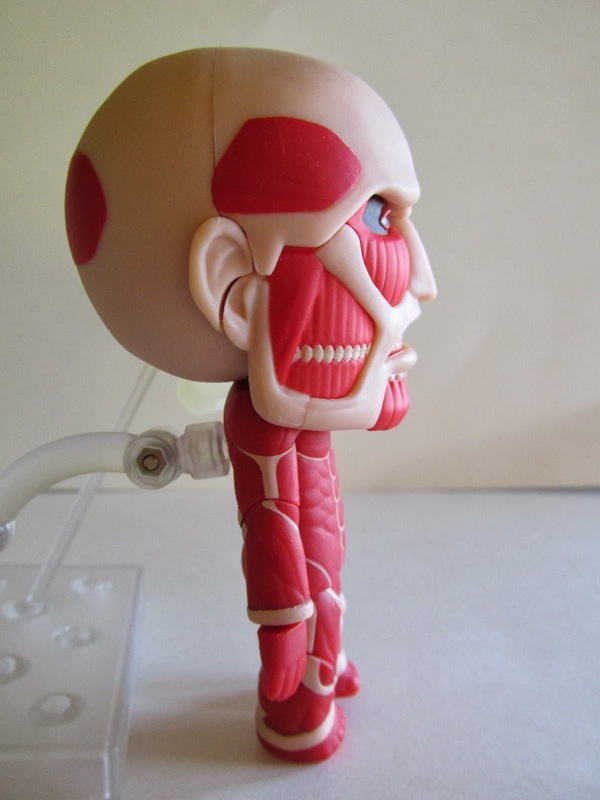 The Colossus Titan is the main figure in this set, and he comes with two faces. Nendoroids usually stick with a more deformed look for their figures, but Good Smile has also included its anime and manga look, which is a welcome addition. Unfortunately, this figure has limited articulation mostly because of his rigid design. He can raise his arms and move his legs, but not on the scale of other Nendoroids. The two faces have great sculpts and appeals to those who like the manga/anime look or the traditional Nendoroid look. 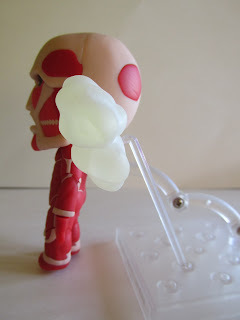 This figure also comes with two clouds of steam that are attached to a small pole that can then be pegged into the base and positioned any way you want. The figure itself is great, but this collectible really shines with its playset accessories. First off, it comes with the Wall seen in Attack on Titan, and it even gives you interchangeable doors that you can show as damaged or non-damaged. The set also comes with several small houses that you can put throughout the playset. The houses all vary in size, but I found it hard to put every house that it came with on the base since space is limited. On top of this it comes with scaled people that can either be displayed on the base or held by the smaller Titans. The set also comes with three small soldiers blasting off in their c-gear with great translucent smoke that follows them. These figures can be placed on the chimneys of the houses and are a nice touch. Another great addition to this set are the three smaller Titans. Each Titan comes with a small base and stand and peg easily into the back. If you watch the show, then these three Titans will be very recognizable. 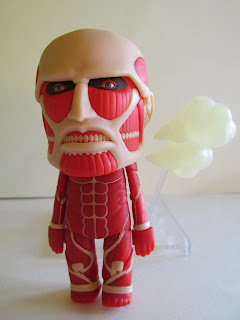 It comes with the black haired Titan, the Titan with a huge mouth, and the small Titan who prances around with his arms out. The black haired one and the big mouth one can actually hold a small person and the big mouth Titan even has a poseable mouth and arm to bring the person closer to his mouth. As you can see, this Attack on Titan Nendoroid release has a lot more to offer from other Nendoroid releases in the past. 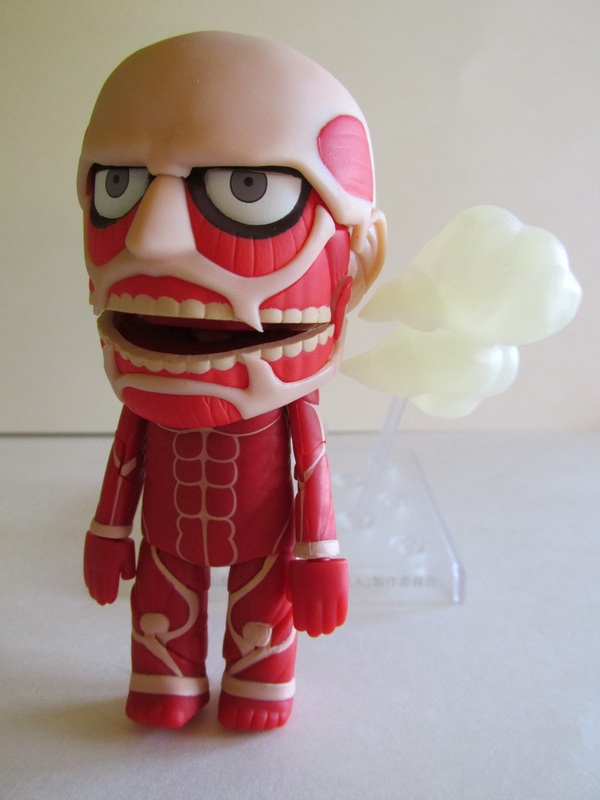 If you are a fan of Attack on Titan or collect Nendoroids, then you should not miss out on this unique offering from Good Smile Company. This release along with future releases of Eren, Levi, and Mikasa should keep any fan of Attack on Titan satisfied until season 2 comes out.